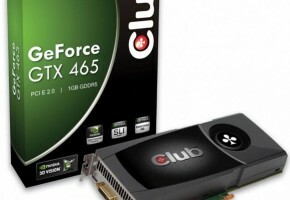 Featuring 352 CUDA Cores and support for DirectX 11, PhysX, SLI, CUDA and 3D Vision Surround, the new GTX 465 is also the most affordable GF100 based graphics card with it US $279 price tag.As noted, the GTX 465 features 352 CUDA Cores and works at 607MHz for the core and 1215MHz for the shaders. 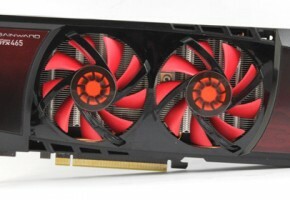 It has 1GB of GDDR5 memory clocked at 3206MHz and paired up with a 256-bit memory interface. 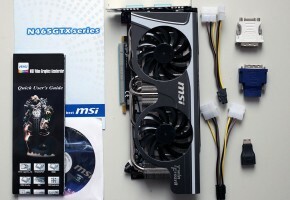 The card still needs two 6-pin PCI-Express power connectors and has a 200W TDP. 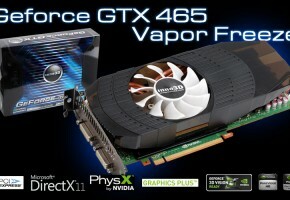 The new GTX 465 looks a lot like the GTX 470 and it still uses the dual-slot cooler and feature two dual-DVI and an HDMI output. 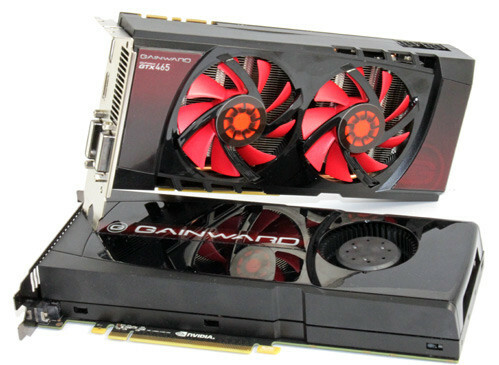 We tested Gainward’s card dubbed the GTX 465 Good, which comes with non-reference, twin-fan cooling. 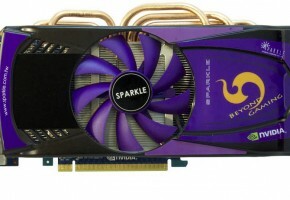 The second card, on the picture below, is Gainward’s GTX 470 which, unlike our today’s test sample, closely resembles the reference card. 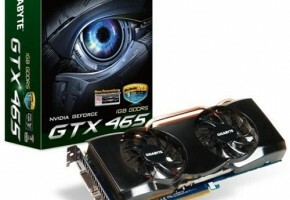 Gainward GTX 465 Good Edition card runs at reference clocks. It’s well worth noting that Gainward was one of the first partners to offer different video out configurations on GeForce card, and their GTX 465 Good features two dual-link DVIs, standard HDMI (not mini-HDMI, as seen on reference cards) and DisplayPort. Don’t forget however that NVIDIA cards support only two video-outs at a time, so if you want more monitors – buy more cards.